The only handle on the market which can be screwed on the tail of the file. The handle which enables you to switch from one file to the other with facility and speed. 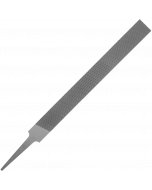 For flat (8''), halfround (8''), three-square (10''), round (10'' - 12''), square (8'' - 10'') and knife (8'') files.